Tesla has begun installing high-power wall chargers at restaurants, hotels, beach parking and other locations that can send 80 amps of electricity into the Model S and add 58 miles of range in an hour. While that’s not nearly as fast as a Supercharger, which can recharge the 85 kWh pack in around 30 minutes, it’s twice as fast as the standard 240-volt chargers that can be more commonly be found around in parking lots and garages. Tesla has been rolling these out quickly across the US as a convenience to customers. The company says 106 of them have been installed since the program began this spring, with more coming online daily. Like the Superchargers, they are free to use for Tesla owners. Unlike Superchargers, which function more like a petrol station, these wall chargers are designed for destinations. Teslas can also use standard charging stations with the use of an adapter that comes with the car but due to the out-sized capacity of the battery in a Model S (up to 85 kWh), a full charge from a standard 240v 10 amp outlet might take as long as 30 hours. 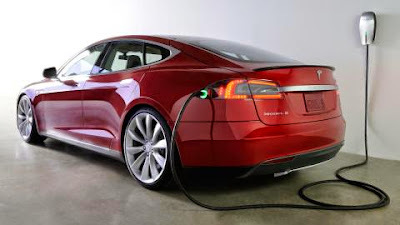 To make utilizing the full range of a Model S practical, for example for weekend trips, higher powered 'destination' charging is required to provide up to 500 km worth of charge in approx 4-5 hours.